and design industry or distribution centers. The main distinguishing feature of the proposed solution is the ability to adapt it to the requirements of modern economy and innovative business processes. It combines the best features of closed systems including ready sets of functionalities, and open systems that can be freely expanded to meet the user’s expectations. 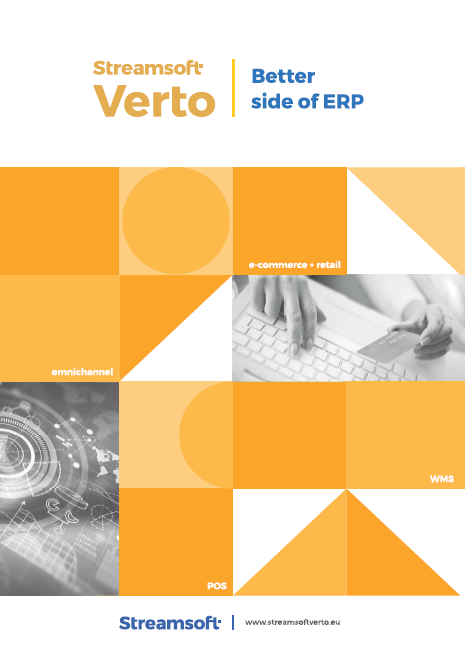 The Streamsoft Verto is a complete, ready-to-implement and use ERP system built on a proprietary platform the Streamsoft Next. Many ERP systems present on the market are not able to meet all customer needs. This particularly applies to areas of nominally insignificant but business-critical functionalities. The Streamsoft Next platform guarantees the implementation of individual customer requirements. What’s more, solutions that are created for this purpose are consistent with the rest of the system – constituting its component part. Therefore, the Streamsoft Verto is distinguished by very large possibilities in terms of matching the individual business and operational needs of a given company.